Sapphires have been prized as great gemstones since 800BC. Rulers of ancient Persia believed the sky was painted blue by the reflection of sapphire stones. A great poet once described the sapphire as “the blue of a clear sky just minutes after sundown.” Blue sapphires were a holy stone to the Catholic Church and to ancient Persians, who believed they made the sky blue with their reflections. To some religions, the blue colour of the sapphire represents the heavens. Kings wore sapphires around their necks as a powerful defense from harm. They preserved the wearer from envy and attracted divine favour. In the 12th Century, the sapphire was known as the most appropriate stone for ecclesiastical rings. The Congolese believed that the star sapphire served as protection and a guard against witchcraft. In modern times, the sapphire grew notorious when we saw Prince Charles gave a sapphire engagement ring to Lady Diana. The Museum of Natural History in New York is home to the one of the most notorious sapphires in the world, the ‘Star of India’, a sapphire of 563 carats! The sapphire has for a long time, been identified with chastity, piety, and repentance. It brings wisdom and truth, increases perception and the understanding of justice. It helps find peace of mind and serenity and promotes a life of sincerity, helping preserve one’s innocence while learning life’s truths. Sapphires also are associated with romantic love, representing fidelity and romantic devotion. It is also used for a quest to increase one’s faith, hope and joy and to keep thoughts pure and heavenly. The sapphire is a corundum, an aluminum oxide with a trigonal crystal structure, in the same family as the ruby. The only difference between a ruby and a sapphire is simply the colour. A red corundum is a ruby. 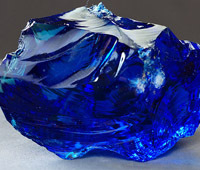 Other coloured corundums are called sapphires, which come in many colours, the most well-known being blue. Because sapphires are available in so many colours, they are the most important and versatile of all the gemstones. Rubies and sapphires are said to be prized just under the level of diamonds because of their hardness. Diamonds are listed as a 10 in terms of hardness, sapphires as a nine. The attribute of hardness of the sapphire makes it a perfect choice for jewellery that needs to stand up to everyday wear, such as in rings or bracelets. Many sapphires also come from Australia, which are dark blue but with a slightly green undertone, as those from Thailand. These tend to be less expensive than those from Burma, Kashmir and Sri Lanka. Sri Lanka is the world’s largest producer of sapphires over 100 carats and they are a lighter shade of blue. Stones from the Mogok Valley in Burma are very highly regarded, and many star sapphires come from there. Dark blue sapphires are found in New South Wales and Queensland Australia. Gems from Western Cambodia are also highly prized, but usually small. 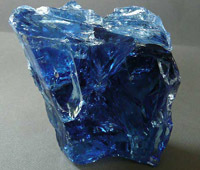 China and Nigeria produce dark stones and in the US, Montana sapphires are prized for their natural metallic blue colour. 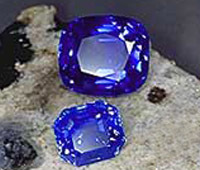 Sapphires also come from Tanzania, Brazil, Kenya, Malawi and Columbia. It is also found in Pakistan’s Kaghan, Naran Valley and Hazar.